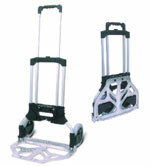 Strong light weight folding aluminium hand trucks, with clever ergonomic design. 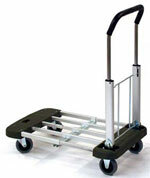 These strong folding Picolino type hand trucks are the ideal light space saving folding hand truck. Easy operation-fold & open within 2 seconds. For use in offices and home, stores easily in closets & car truck. Suitable for factory, office, fishing, boat, travelling, warehouse, shop. The security rope is unique designed to fit into the truck frame base. Easy operation-fold & open within seconds. For use in offices and home, stores easily in closets & car truck. Suitable for factory, office, fishing, boat, traveling, warehouse, shop. The security rope is unique designed to fit into the truck frame base.